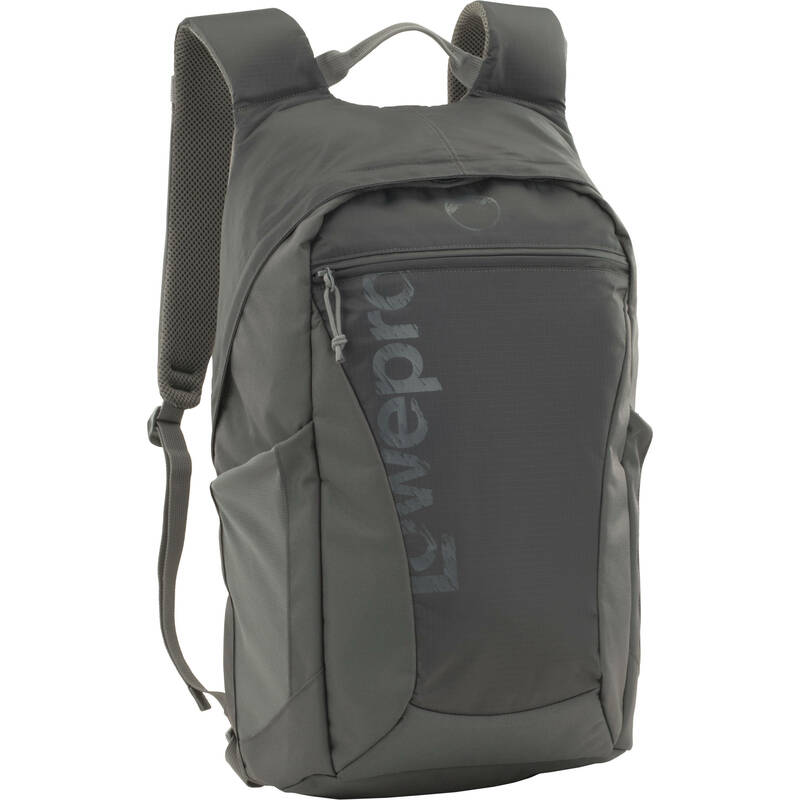 The slate gray Photo Hatchback 22L AW Backpack from Lowepro is an excellent choice for a day out in the field, walk along the boardwalk with the family or even a quick down and dirty gig. It's designed to hold your DSLR with an 18-105mm lens attached and two or three additional moderately sized lenses, flash, accessories as well as your iPad or tablet held safely within its own dedicated compartment. The "wow" feature of this bag is that it comes with a removable camera box which, when removed, turns the pack into a full-fledged, empty pack that can be used as a daypack. The camera box comes with a storm flap for protection and two handles for easy removal. Load it beforehand, place it in the pack, and you're off. And, on days when you don't need it, just lift it out and the pack is ready for clothes, books, food, jacket or groceries. Access is via a top loading zippered opening or its very handy side "hatch" for rapid retrieval of your camera when the shot appears. All the zippers are YKK for added durability. The 2.1 lb pack is comfortable with its adjustable backpack straps. This is an outdoor pack that is prepared for all weather eventualities since it contains Lowepro's All-Weather cover that can be rapidly deployed when the weather turns against you. The Photo Hatchback is made from strong 600D polyester and 210D nylon ripstop polyurethane-a combination made for the outdoor enthusiast. It is backed by Lowepro's lifetime warranty. Box Dimensions (LxWxH) 19.6 x 10.1 x 7.1"
Photo Hatchback 22L AW Backpack (Slate Gray) is rated 4.7 out of 5 by 179. Rated 4 out of 5 by Nick P. from Would buy agai It's a nice backpack with a lot of space. Fits a camera with a zoom lens + two other lenses easily, maybe space for a small one and/or a flash. There is additional space in the top loading compartment as well. The mesh pockets on the side will hold a water bottle or a small tripod. A top-strap so it could hold a bigger tripod would have been nice. The backpack has a pocket on the backside to access your camera easily. It's not as easy as a side-pocket, but protects well. The camerapocket can be removed as well to give you a full backpack. There is an additional front pocket that can hold a small laptop or a tablet. Very versatile backpack, great for day hikes. Rated 5 out of 5 by sgvdomer from Glad I bought this backpack I have to say this backpack is slightly bigger than I imagined (think standard backpack that a college kid would carry). I have a Nikon D7100 with 18-140mm attached. This combo fits easily in the cubicle with at least 1 to spare. I can also fit in another 3 lenses if I wanted to. Since I only have 1 extra lens (50mm), I decided to put my charger, remote, air blower in the empty slots and still have room to spare. The upper pocket can easily fit a small jacket and snacks. The side pockets can fit 2 bottles of water. This backpack is so well-designed and appears to be made of high quality. Overall, I'm very impressed with this backpack. Highly recommend. Rated 3 out of 5 by KJLMPL from Not for Me but a Nice Bag I am a mom w/ 2 little ones and I purchased this bag b/c I need protection for my camera while being able to carry a couple diapers, some wipes & misc toddler necessities. This bag has the space, the camera protection & even a place for sippy cups but it was huge on my 5'3 average sized frame and I felt and looked really awkward. It was also pretty stiff. This would be a great purchase for a medium to large sized man. I am thinking about getting the next size down. Rated 4 out of 5 by devilchills from Good travel Bag Got all the right pockets at all the right places for all the equipments that I want to carry. Camera Sony a6000 2 lens Joby tripod two chargers (camera battery) three camera batteries nissin 40 flash sensorklear sensor cleaning kit photographer essential filter kit lithium battery charger (flash battery) extra flash batteries (total 8x AA) Maps (like 3) two water bottle Camera raincoat tshirt hat etc etc etc It surprises you how much I can stuff into it...get it now! Also rain cover on the bottom, makes this backpack rain proof. Rated 4 out of 5 by Kai P. from Worth for the price Pro. Good size camera bag for traveling with DSLR (with full frame body D 800 size and 24-70 plus a flash) or daily use without camera compartment. Light weight. Nice look. (Just a bit alike college students style ) Cons. The padding holds the body temperature(hot). I think its just like regular foam. Can't do any hiking or travel with it in summer time. Not able to carry 70-200 in camera compartment. No tripod holder or strap. (Really don't know why they have two water bottle holders) Conclusion Worth for this price at B&H. Fits for anyone who need a backpack to carry DSLR with a bit personal items. Rated 5 out of 5 by Mark from I was really lucky......... I was really lucky to purchase the Lowepro Hatchback 22L in that it is a discontinued item. Wavering about the $99 price tag , I jumped on it when I found it for $49 at B & H Photo, my camera go to store. I found that my Lowepro Slingshot 250AW wasn't working for me due to my neck and shoulder problems. The Hatchback 22L is a high quality backpack, with plenty of room for my Nikon d300 with 16-85 lens plus 2 other lenses or flash depending on how you organize the camera box. The best part is of course the equal weight distribution on my shoulders, allowing me to travel longer with it. The side pockets can hold water bottles securely, a nice touch. Rated 5 out of 5 by Jon with the Camera from Great bag for First off, its a very nice looking backpack, and has a slim profile. Its great for security since the only way to access the camera/lenses is through the hidden back compartment, and if you need to switch lenses constantly like me, you can snap on the waist strap and swing the backpack over to the front, open it up and switch lenses without having to put the bag down. It works very well as your day-to-day bag also, just remove the camera department that's held in place by velcro, and now you have a full sized backpack that now can fit your 15.6 laptop, not just your tablet. Lastly I'd like to point out the build quality, its great, doesn't feel cheap and is very weather resistant material, and in a worst case scenario you can pull out the rain cover from the bottom (which I've had to use all the time in rainy South Florida) or if I'm at the beach the cover makes it easier to clean the bag. The only con I can really think of is that the material that rests on your back gets pretty warm, especially when you hike, other than that its great, I highly recommend it. Rated 5 out of 5 by Daniel from Great for families I have a 3 year old and I really can't be taking out a camera bag plus another bag for her stuff (food, water, supplies, small toys, etc.) This works well. Little over 50% of the volume is the camera section, and then the top is just open space for throwing in stuff. Even has drink holders on the side for each of us. The camera section isn't that big. I can fit a 5d3 with 24-105 mounted, 85mm 1.8 and 580 ex ii...but that's about it. If I remove all the dividers, I can fit the 100-400 IS II mounted on the 5d3 but it's an awkward fit. Overall, really like it. Very versatile bag and was just what I was looking for. This bag may be a bit snug. I would check out the Ruggard Outrigger 45. Is this bag washing machine safe? Unfortunately we cannot know if it is machine washer safe. It is recommended you contact the manufacturer to ask them for more in-depth cleaning requirements of their bags. Is the front pouch padded, also will it hold everyday items with the camera box installed? Looking at this to take along with my family and I have 2 little kids. I need to be able to carry the camera and some small snacks, diapers, etc. The camera pouch is indeed padded and does a good job protecting the camera. The top section is not very large though. I have managed to carry a set of gloves and a rolled up sweatshirt but even that is pushing it. Answered by: MICHAEL R K.
would it fit an 13 macbook pro retina (2015)? I just received the bag. I've stored a Sony a6300 + 16-70mm lens on it, the underwater housing and two other lenses in the camera compartment. I was then able to slide my Macbook air 13 in the back part of the bag. It left plenty of space in the front pouches. Love the bag already! I plan on using this bag with my Sony a5000 for a one week trip to Seattle. My only concern is if I will be able to use it as my carry on on the airline, do you know if this bag would be accepted? Hi. I am not 100% what your concern is so forgive me if I fail to answer your question. You will be fine as far as size is concerned. It is the size of a medium backpack. It will fit your camera, snacks, a small laptop or tablet, and a light jacket. Because you do not want to squish your camera, you might end up putting it overhead, but it will fit under the seat. Will the backpack accept a 70-300mm lens? Will this backpack feet a Nikon D810 attached to 28-300mm lens? not really. if only that yes. How wide is the front pocket zipper opening when completely opened - in other words, what is the widest thing I can squeeze in there assuming it is a thin flat object?